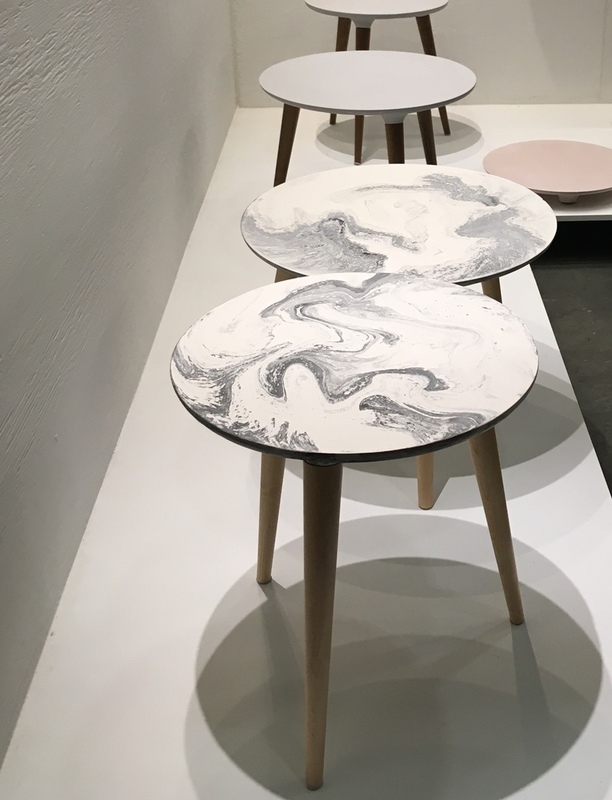 At IDS Vancouver and its offsite program, installations, furniture, lighting and accessories by Snarkitecture, Luvere Studio, Leah Amick, Omer Arbel and Knauf and Brown – among many others – caught our attention. Here are 25 standouts from the show and beyond. 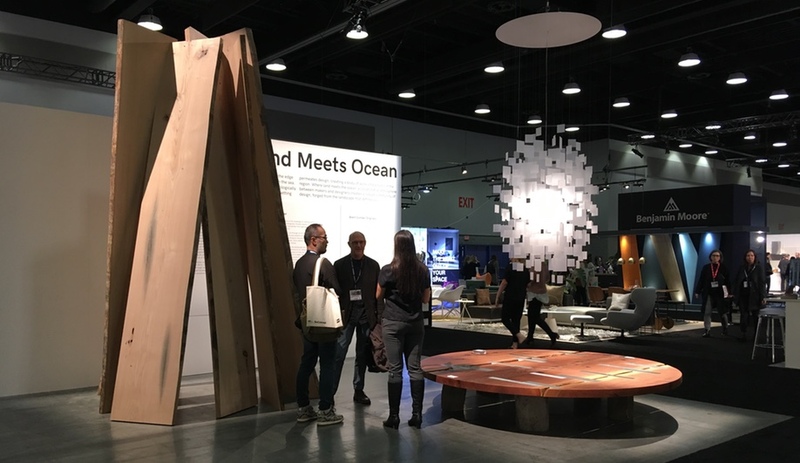 IDS Vancouver just wrapped and we’re gathering our notes – and endless photos – on our favourite things, both at the fair and offsite. Some of the standouts at the show were the What the HEL exhibit of Finnish furniture, lighting and accessories – which emphasized craft and sustainability while also displaying the playful and colourful side of Nordic design; Avenue Road’s stand showcasing the work of Sebastian Herkner, who spoke on Azure Trade Day (we also got to tour the new Gastown showroom); and the Caesarstone collaboration with Snarkitecture, which combined the poetic with the practical: the Altered States installation with a stadium-style arrangement of chair-slash-storage pieces topped in the Quartz surfacing material. In offsite group shows that highlighted community spirit, talents both emerging and recognizable shared the spotlight. Hinterland and Ben Barber combined forces at the Hinterland showroom, Kate Duncan hosted the Address Assembly show of designer-makers in their prime, and the group show Outside Influence brought together beautiful pieces by talents including Omer Arbel, Lukas Peet, and Knauf and Brown. At Inform Contract, the finalists and winners of the annual LAMP competition were each impressive in their own light. 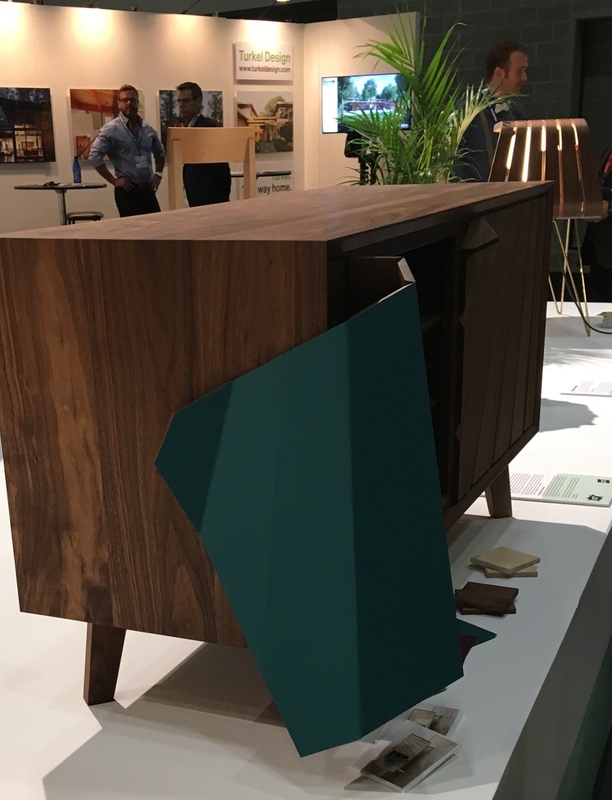 At the show proper, there were talents to be scouted throughout, including Leah Amick and Alif Alimzadeh, who won the Prototype award – the first time two designers have shared the prize – for the Peel Credenza and Layer Up project, respectively. 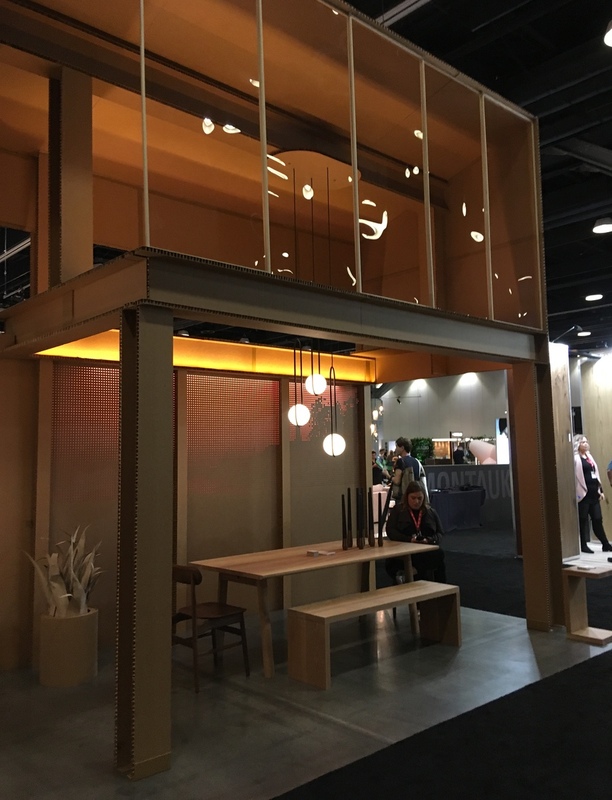 The most daring piece at IDS by far was the Sym Tower by Toronto’s Luvere Studio, situated in the Canadian By Nature feature. But perhaps the most popular designers were Leckie Studio, La Salle College and OriginsCNC, who together created the Untitled bar – the snazzy plywood creation where visitors gathered throughout the fair. Here are just a few images of all of the above, and more! 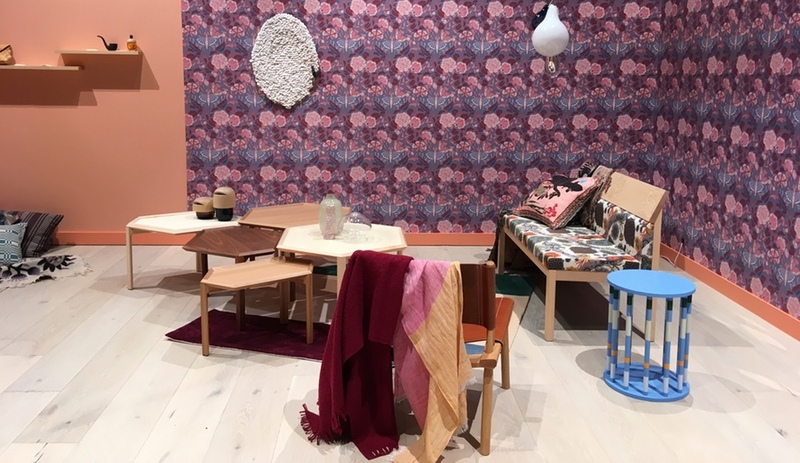 Vibrantly curated into various living zones by Susanna Björklund, What the HEL featured clay crafts by Studio Smoo, wood-crafted furniture by Nikari Oy, a wood basin by Woodio, a rug-chair by Tuula Pöyhönen (below) and so much more to feast one’s eyes on and run one’s hands over. As a whole, the feature showed off the covivial, colour-saturated side of Nordic design. 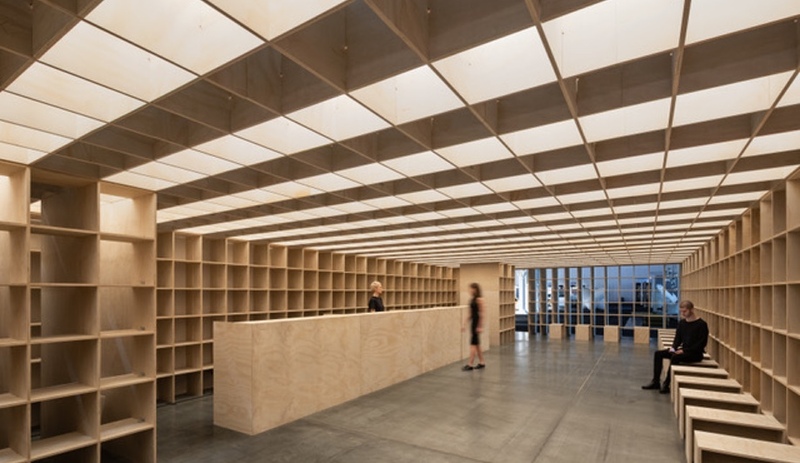 Leckie Studio, OriginsCNC and LaSalle College assembled the fair’s central bar, named Untitled, out of 392 intersecting sheets of plywood. It was the first year the show enclosed its main watering hole thusly, and it proved a popular decision: the blond-wood spot was a cozy enclosure in which to grab a drink or meet up with friends and contacts. Land Meets Ocean featured three talents exploring the mountain-meets-forest uniqueness of the West Coast. 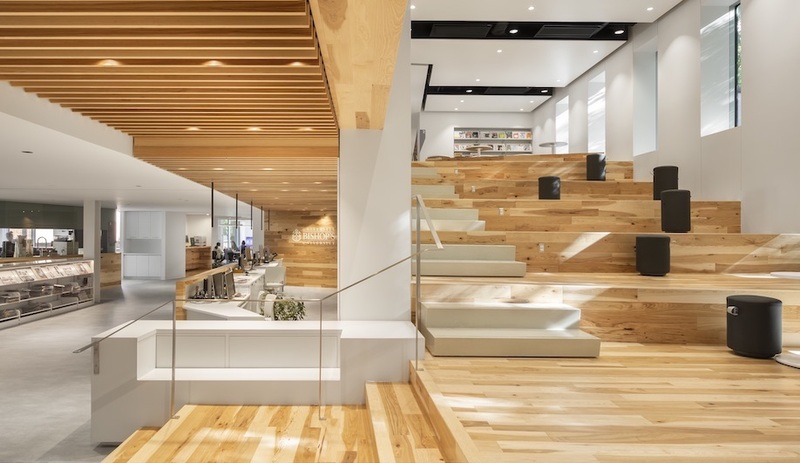 On display was a soaring, timber-slab tower by Van Urban Timber, a cascading light fixture by Propeller and an enormous round table – featuring dramatic glass inlays – by Brent Comber. 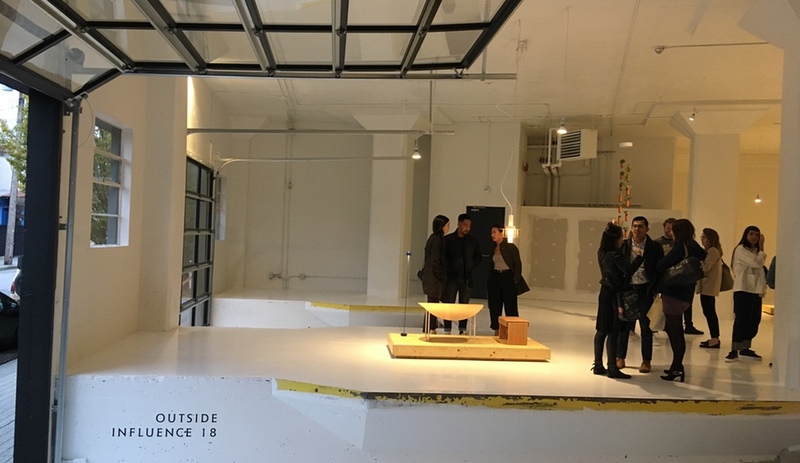 The Outside Influence group show, located in the future home of Inform Contract, provided visitors with a marvellous factory experience – its shipping bays the main points of entrance. 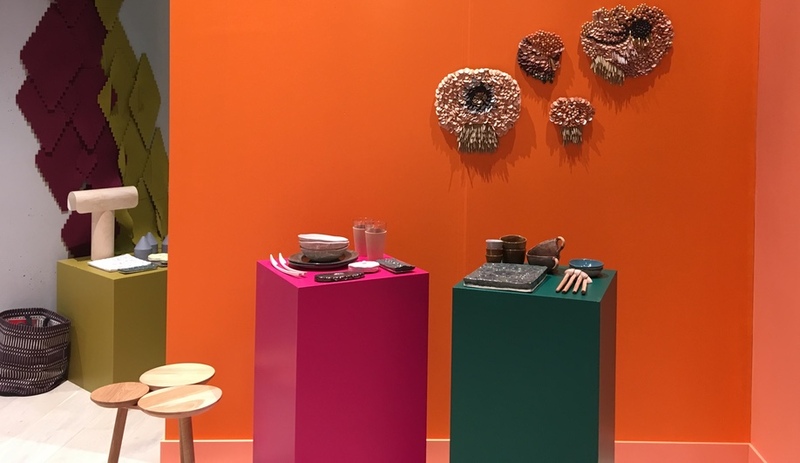 With a plethora of rising talents among the exhibitors, the show functioned as a snapshot of the most important emerging and established talent on the West Coast. 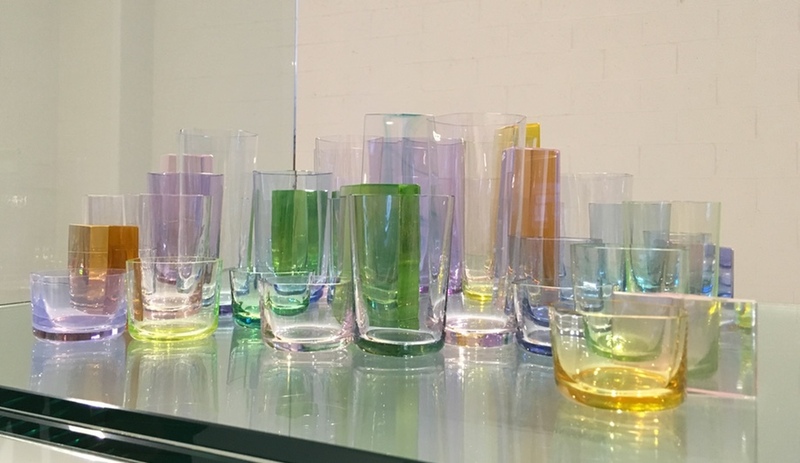 Among the designers showing their work at Outside Influence, Omer Arbel presented his beautiful, delicate, pastel-hued 31.3 Polygon Glassware collection, from his OAO Works line. 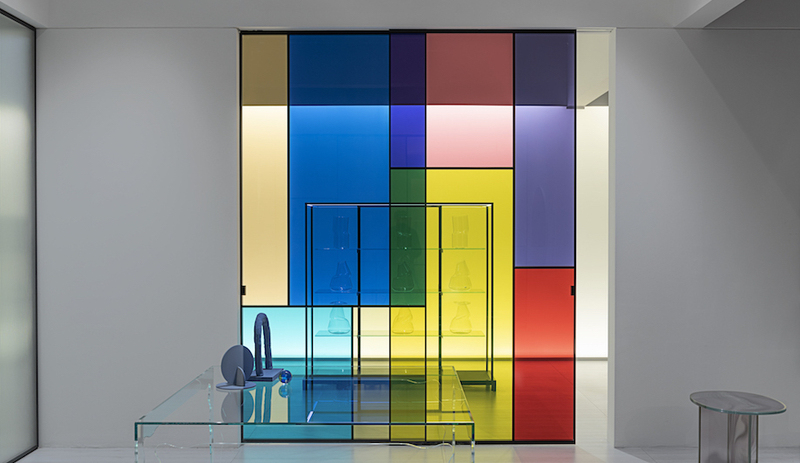 The blown and cast glass pieces, informed by traditional Czech glassmaking, are sold in groups of 31 individual glass elements designed to be displayed together, just as Arbel did in three levels of a tripartite glass cabinet. 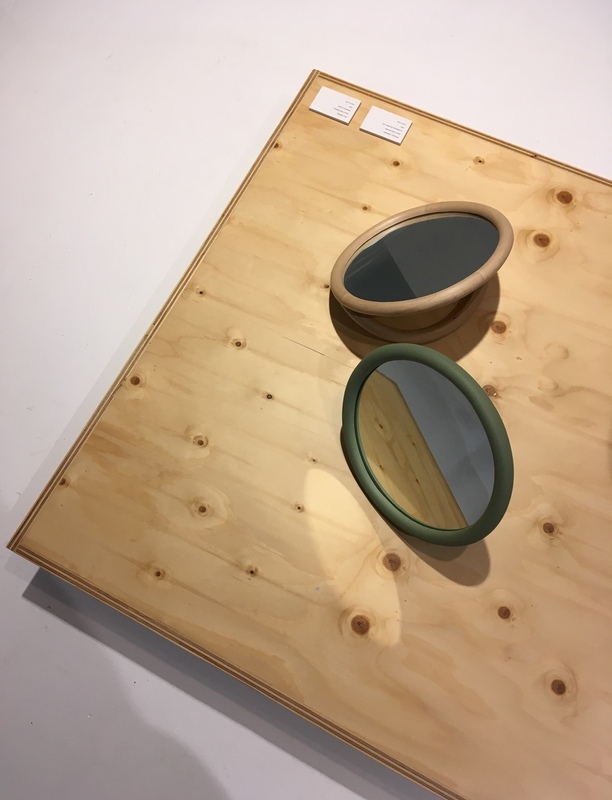 Internationally beloved Vancouver studio Knauf and Brown also showed a number of well-resolved pieces, including the Tack bench and these lovely Roli mirrors, which come in bamboo and glass. 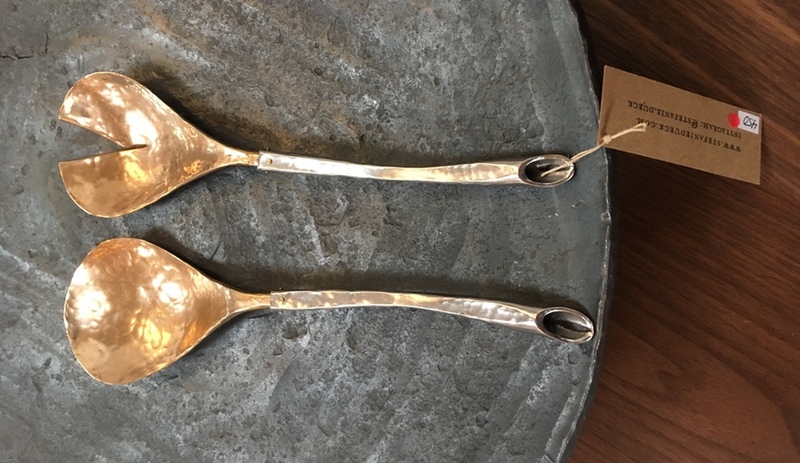 Stefanie Dueck‘s metalwork was one of the highlights at Address Assembly, an annual showcase of designer-makers who focus on honest materials, like wood, stone and metal. The show is curated by Kate Duncan, whose own beautifully crafted furnishings in wood included a bed frame and a communal table. Avenue Road’s stand at IDS was dedicated to the creations of German designer Sebastian Herkner. Underfoot the glass tables and soft seating, the porcelain tiles resembling bamboo are also designed by Herkner. Their half-cylinder form was inspired by a soap bar Herkner created for his Das Haus installation at IMM Cologne 2016. The tile is now produced by Kaufmann Keramik. 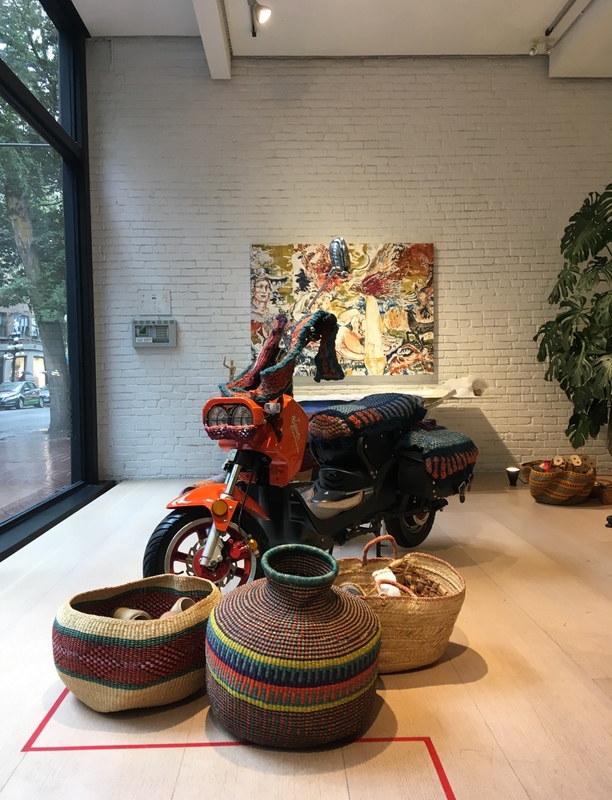 Avenue Road didn’t only impress at IDS – its showroom in Gastown, designed by Abraham Chan, is a must-see destination for all design lovers. 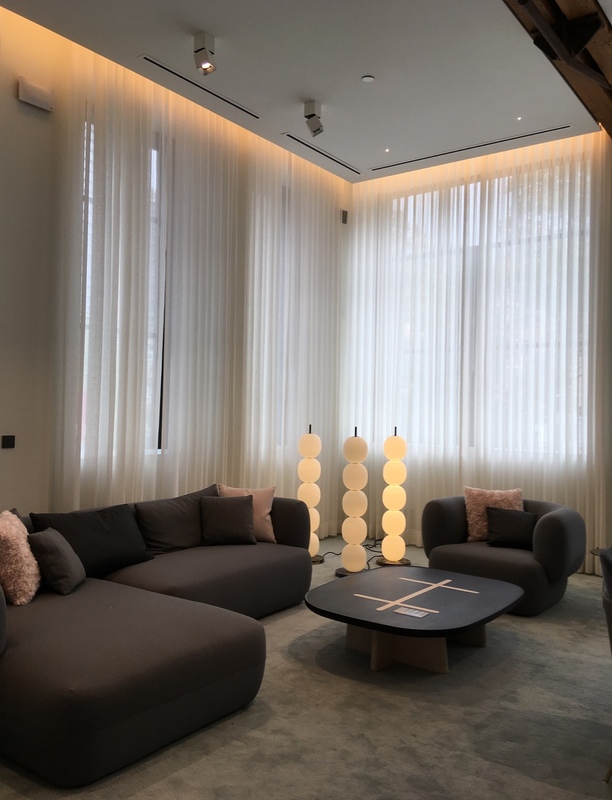 Among its many furniture and lighting lines – not to mention almost an entire floor devoted to the Rug Company’s artistic floor pieces – the two-storey interior also includes a resplendent flower shop, Hanna by Celsia Floral, on its lower level. 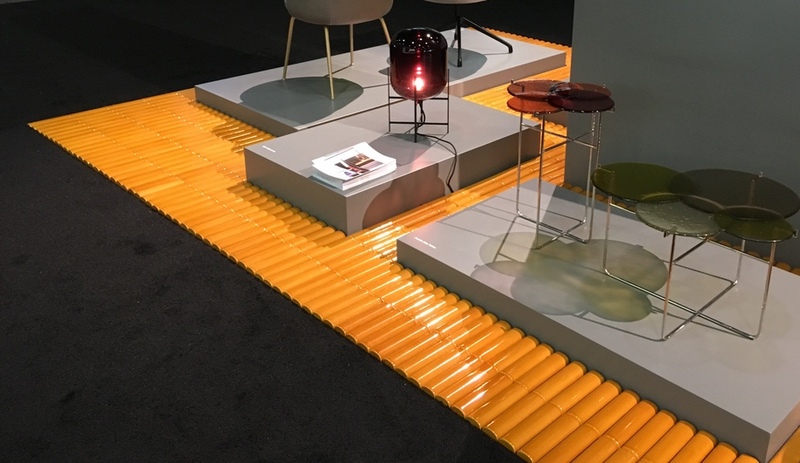 In an unprecedented move, the Prototype jury – Azure magazine’s Elizabeth Pagliacolo, designer Sebastian Herkner and Emily Carr University of Art + Design’s Bonne Zabolotney – chose two winners. Leah Amick’s Peel Credenza was an obvious choice; the well-crafted piece features magnetized, pleated doors that peel away from the frame. It was a delight to open the piece and marvel at its elegance and sophistication. 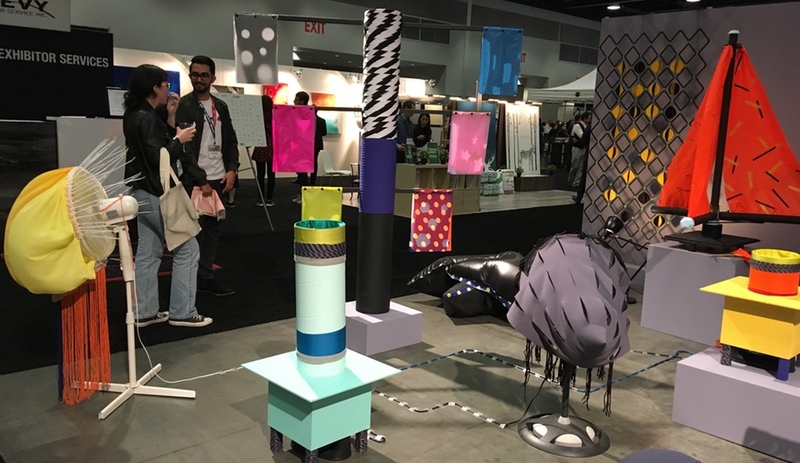 Moving Textiles was a quirky showcase of kinetic fabric sculptures, created by Netherlands-based design collective Envisions and the Wilson School of Design, Kwantlen Polytechnic University. While highly experimental, and somewhat temperamental, the remote-controlled pieces were also a whole lot of fun. 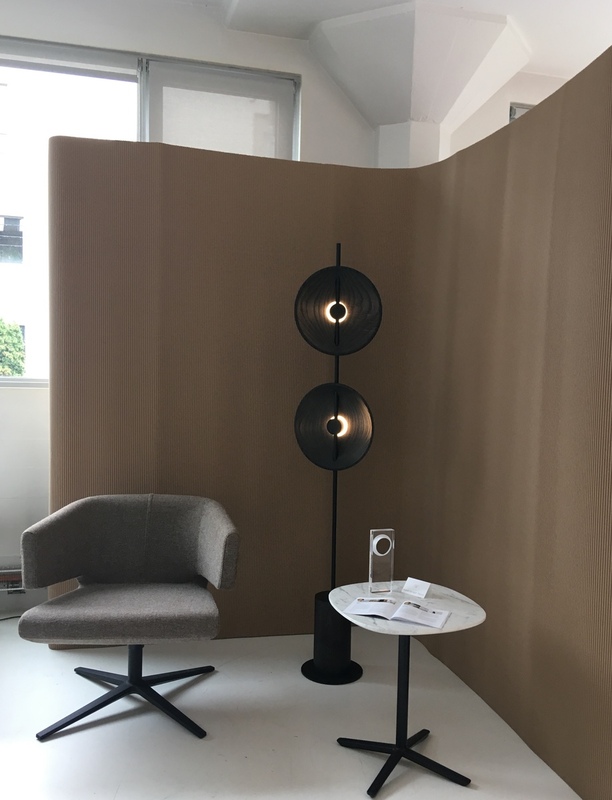 The LAMP Competition annually culminates in a group show, and this year there were many brilliant ideas on display at Inform Contract. Mito (above), by Tom Fereday and Rakumba Lighting, of Melbourne, Australia, won in the Established category. The winner in the Emerging category was Highwire by Toronto’s Anony Studio and the Student winner was Driftwood, by Nathan Sui from Mississauga, ON. 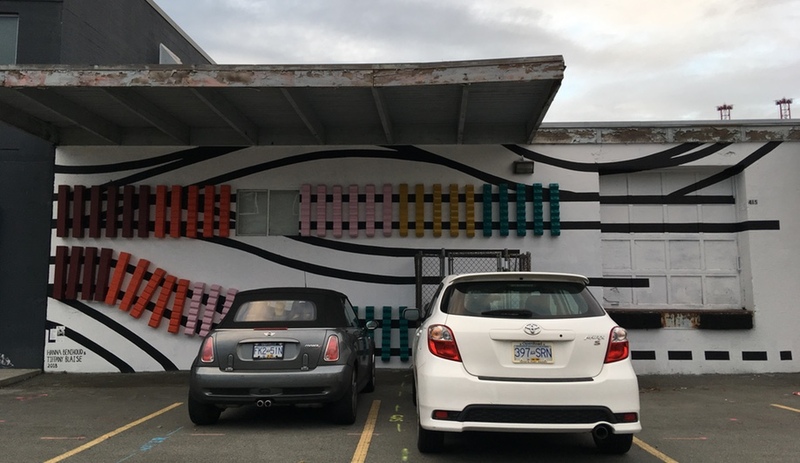 Railway Street, home to many high-end design stores, is worth checking out simply for its views of stacked shipping containers – and public art. 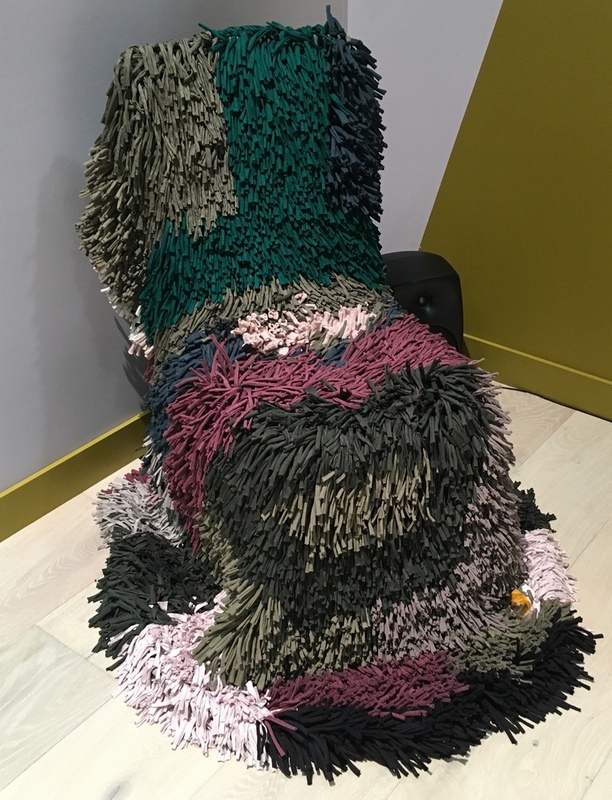 This evocative piece by Hanna Benihoud and Tiffany Blaise, made with painted wood blocks, caught our imagination. 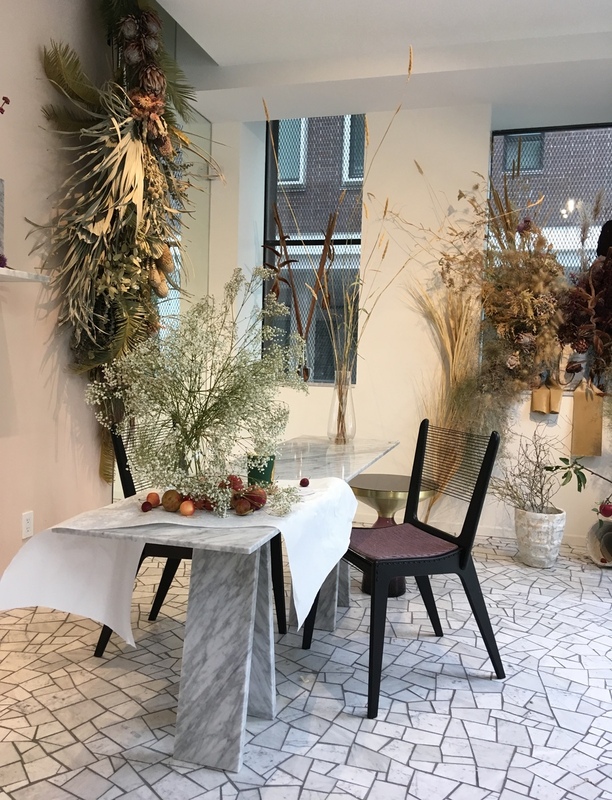 A trip to Vancouver isn’t complete without a stop at Inform Interiors, the capacious showroom of Niels and Nancy Bendtsen. It’s window displays are gorgeous on their own. 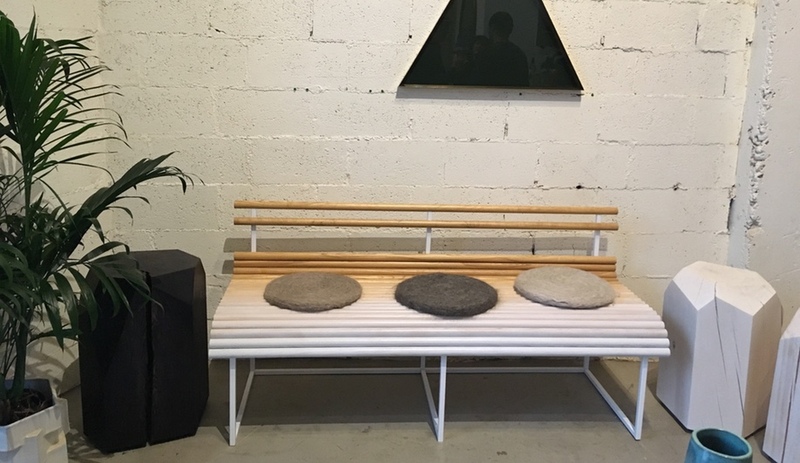 At Hinterland’s Railway Street showroom, we happened upon the Fogbench: constructed with solid white ash and powder-coated steel, the piece features an unusual gradient finish – a result of its backrest being treated with oil. Ben Barber’s Pluto table clues you into the sense of humour at play in the Vancouver designer’s unconventional work. The base is made of aluminum in a variety of powder-coat options, and the top comes in either clear or dark grey tinted glass. A matching, or brass-crafted, bolt secures the two together. 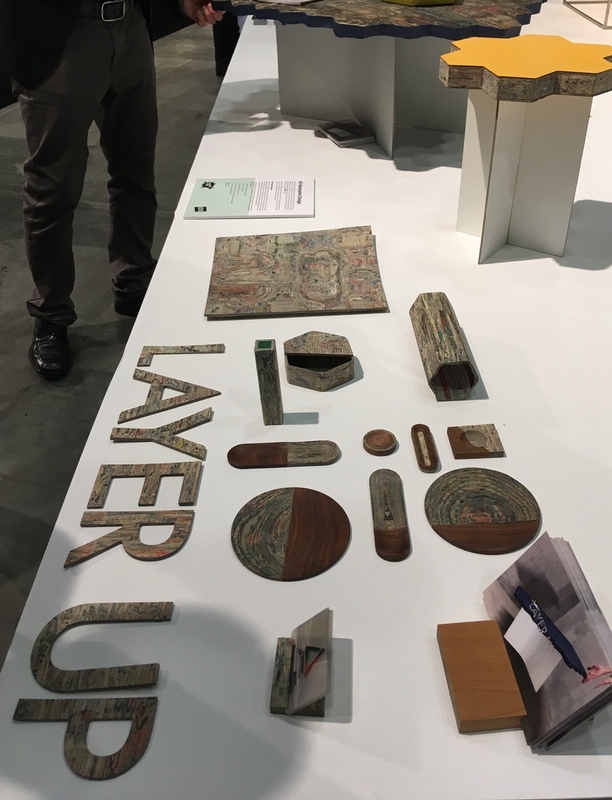 International brands were also present at IDS Vancouver. 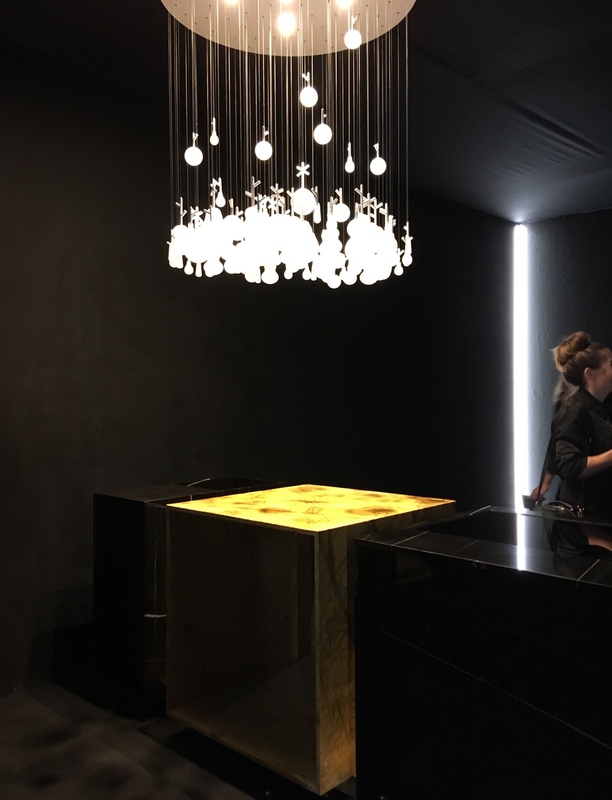 Italian kitchen manufacturer Minotti showed off the modular (and spectacular) Anima kitchen and Lasvit provided the Growing Vases chandelier, designed by Nendo, above. For the Open Studio feature, IDS invited a group of up-and-coming interiors firms to create 100-square-foot bathroom designs with fixtures and fittings by DXV and other LIXIL brands. 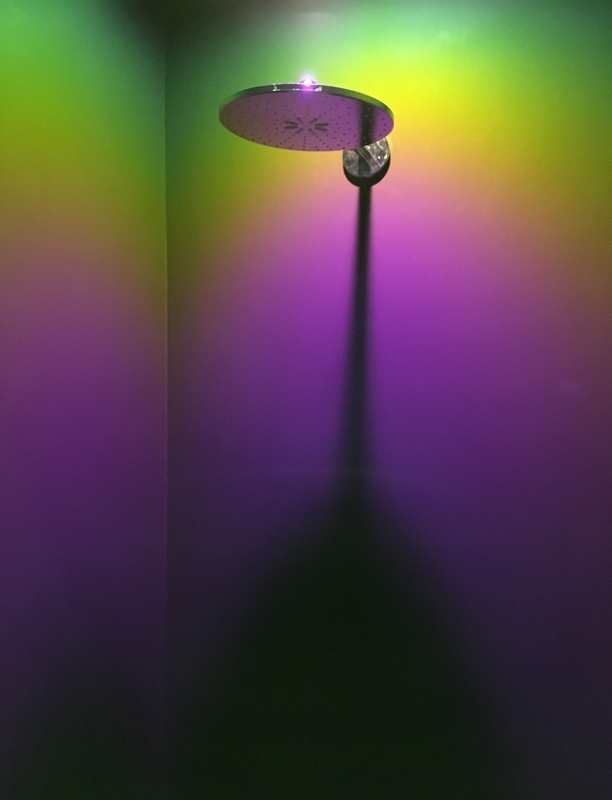 For its part, Case Study Studio created a tight maze, boasting an Instagram-friendly dichroic exterior, that led to a single, light-pulsating shower enclosure. 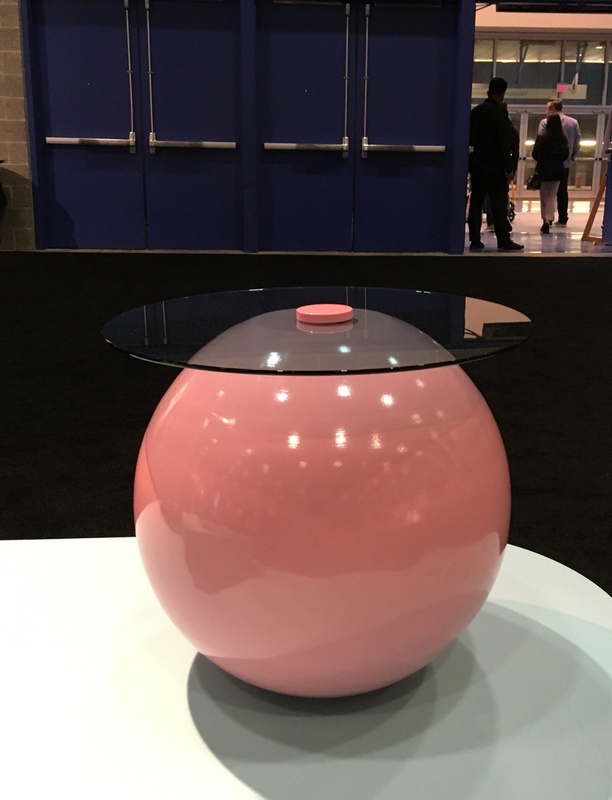 Silence World Design created this make-it-yourself coffee table for the consumer-craftsperson. The kit includes plastic moulds and stone powder (which mixes with water to create a marble effect), pigments and wood legs. We think it’s kind of ingenious. 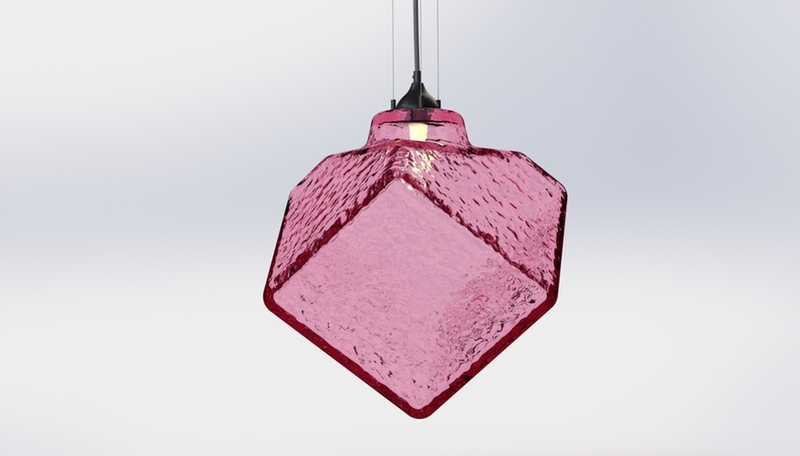 Lighting designer Matthew McCormick creates showpiece fixtures. But just as cool as his in-demand designs was the cardboard booth crafted by Lock & Mortice to contain them. Toronto’s Luvere Studio is interested in bringing nature into our homes and interiors – and in some very surprising ways. 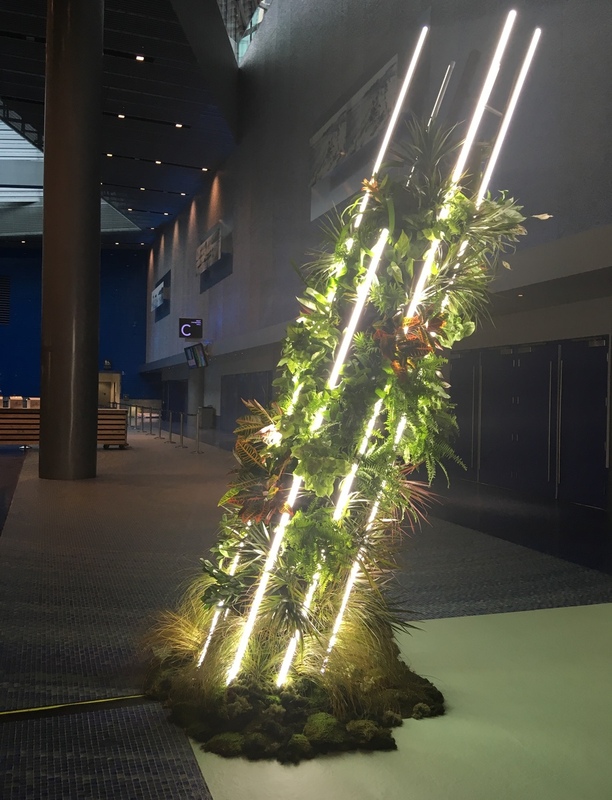 Their Sym Tower, part of the IDS showcase Canadian by Nature, consists of 3.6-metre tall light tubes slanted Tower-of-Pisa-like and filled with 100 live plants. It was a definite highlight of IDS and an exciting debut for the studio. 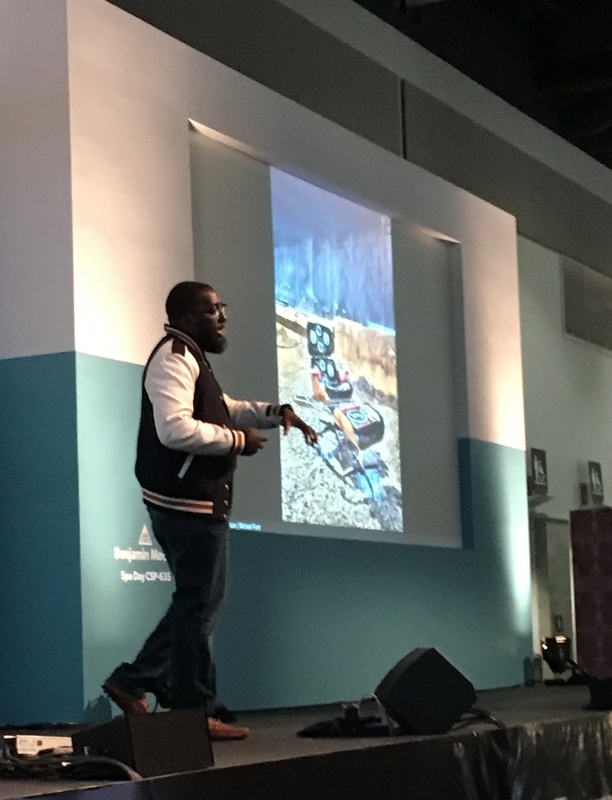 Taking the stage as part of Azure Trade Talks, Michael Ford – aka The Hip Hop Architect, and the founder of Brandnu Design – began his presentation with a witty overview of what design looked like before and after hip hop (on the screen is the Eames Lounge Chair after hip hop). Through his camps for kids from underrepresented communities, Ford is hoping to introduce the design and architecture professions to youth who can make a positive difference in their environments. Fieldwork Design is best know for its handsome architecture. 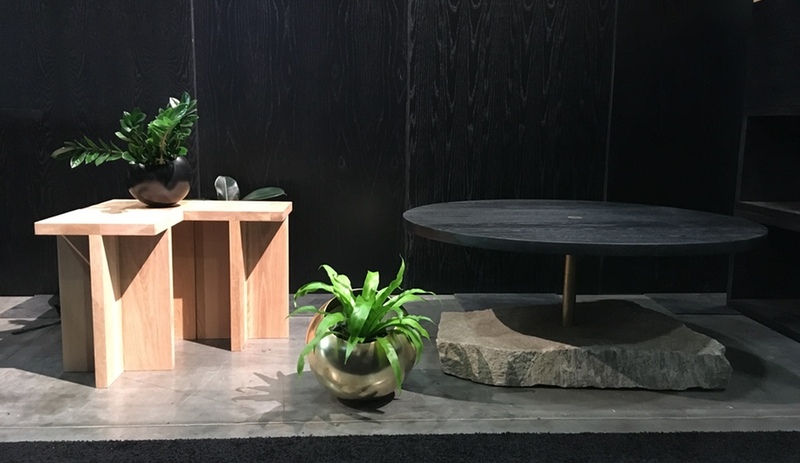 At IDS, the Portland, Oregon, firm displayed his deftness with design, showcasing pieces in rough-hewn wood and stone. 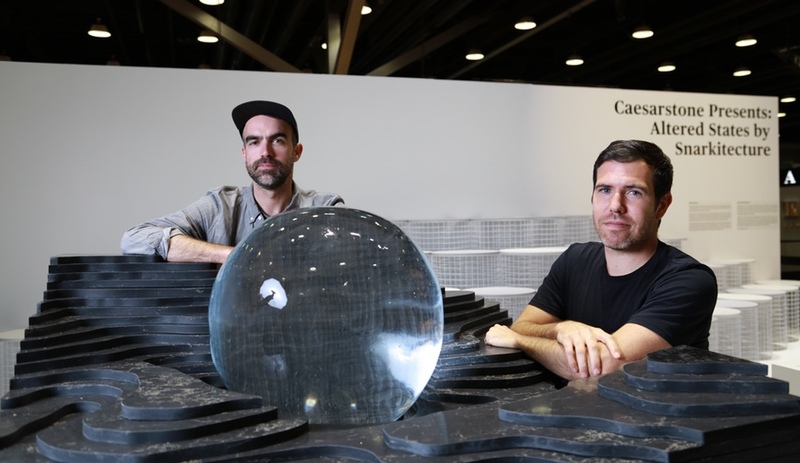 Altered States, the installation by Snarkitecture (Alex Mustonen, left, spoke at IDS; to his right is Benjamin Porto), was reinstalled in Vancouver to show off the poetic possibilities of Caesarstone surfacing.